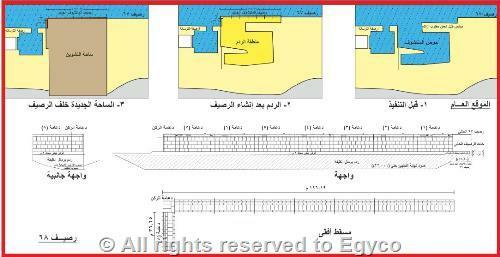 Construction of Quay (68) in Addition to Development and Re-planning of El- Manteshouf Basin – Alexandria Port. - Dredging the quay wall trench; to reach the rock layer suitable for foundations on depth of (22 m) below sea level. - Quay wall trench backfilling with clean sand, then cast rubble to form basis foundation layer and leveling its surface with gravel. - Place quay wall blocks, and perform the preloading test. - Casting of coping beam and installation of bollards and rubber fenders. After the quay wall construction, the following works were executed: rock backfill and a gravel filter layer, then backfilling the area behind the quay, finishing the storing yards, and making concrete casting and interlocking tiles installations.